HBS is the school renowned for training tomorrow’s leaders by helping them to make better decisions. HBS has been using the case base approach to do so for decades. As I just started my MBA at HBS, it is too early for me to comment on the efficiency of this approach. However, as an international student who has been in the US for about two weeks now, I have noticed that the US soil is itself is a place where you are forced to continuously practice your own decision making process. Here’s how I perceive a typical day in the US (let’s say a nice sunny Sunday). You start with a brunch where you choose to order the ‘Eggs&Meat Breakfast’ from the elaborate menu card. The waitress will then ask you how you want your eggs (boiled? scrambled?) and if you prefer sausage or bacon. Later on you go to Staples to purchase a new printer (do you want additional warranty on that?) which you’ll pay with your bank card (debit or credit?). From Staples you head to a nearby Starbucks where you’ll have to think about the size of your drink (small, medium, large), which milk you want (plain, low-fat, soja), if you want it served hot or cold (frapped) and last but not least if you would like whipped cream on that. You end the day at a restaurant where you order a beer (Draft or bottle? 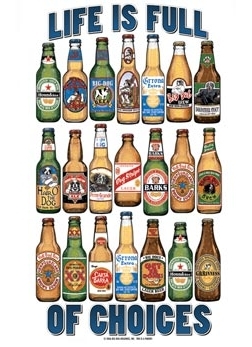 Budweiser, millner, Heineken, Corona, Hoegaarden, …???) and a nice paste of pastas (what kind of cheese would you want on that?) and the type of accompanying salad you would want with that (normal, special, ceasars… each with their own dressings (oil & vinigar, …, you name it!) before finally having to make a call on what kind of (mandatory) tip you will leave behind for service. Once decided upon 15%, you’re just left with calculating 15% out of $63.48 and you’re all set! One last dessert before going to bed: ice-cream! How do you want it? (blended, frapped, sundae? ), whipped cream? Cone or a cup? Which of our 20+ topping selection do you want? This entry was posted in Life in the USA and tagged beer, Decision making, HBS, US. Bookmark the permalink.